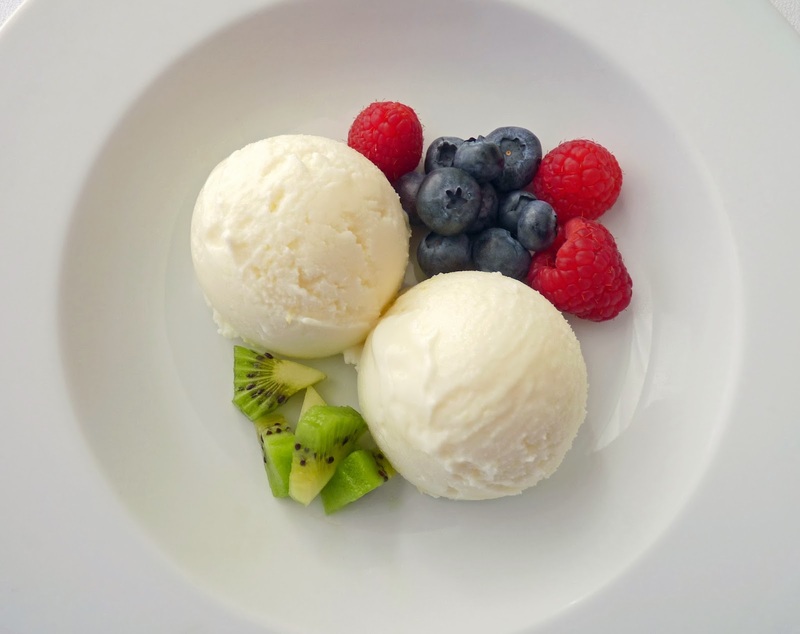 Frozen yogurt is tremendously popular and it’s also incredibly easy to make. 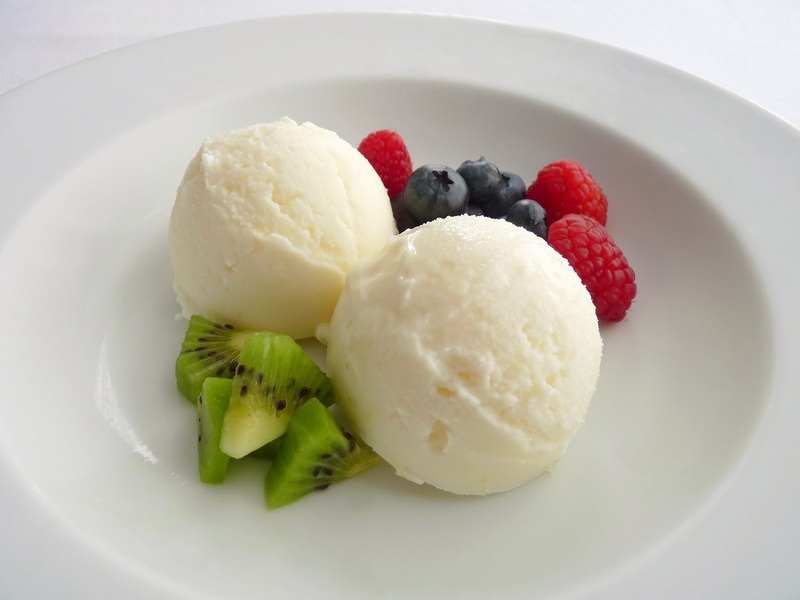 Just whisk a few simple ingredients together, chill it and then take it for a spin in your ice cream maker. No stress and practically no mess. This is a very tangy Lemon Frozen Yogurt, a good lower fat alternative to ice cream. It’s a great refresher and especially good if you’re looking to enjoy a lean and light treat after a run of very heavy meals throughout the holidays. I like to serve it with tart fruit, like blueberries, raspberries and kiwi. Easy, delicious and beautiful. - Use your favorite brand of plain yogurt. It can be full fat or low fat. - Salt is important to brighten the taste of dairy products. Add a few grains at a time until the flavor pops. - Start your ice cream machine and then pour in the mixture This will help prevent a thick layer freezing to the sides of the canister. 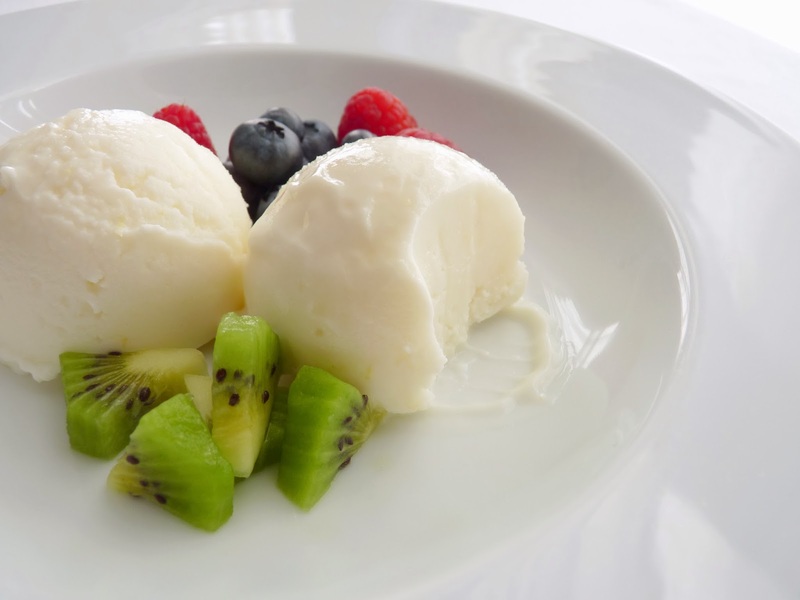 - Packing ice cream, sorbet or frozen yogurt tightly in the container and then pressing a piece of plastic wrap into the surface helps to prevent ice crystal formation. Whisk together the plain yogurt, sugar, lemon juice and lemon zest until thoroughly blended. Add a pinch of salt, to taste. Pour into an airtight container and chill thoroughly, preferably overnight. Freeze in your ice cream maker according to the manufacturer’s instructions. Pour into an airtight container, packing tightly to eliminate any air pockets. Press a piece of plastic wrap into the surface, cover and place in the freezer to firm up. This recipe does seem like the perfect foil for holiday over-indulgences. I made your ginger ice cream (which was unique and wonderful) and I was thinking of making a batch of cinnamon ice cream next. It's now happily tabled and lemon frozen yogurt is in the queue. I missed your challah recipe last week. I think they are the perfect little knotted gems. Great photos. Also, I am wondering what the texture difference would be if Greek yogurt was used. Is that as interchangeable as lowfat and whole milk plain yogurt or would it effect the final product? Hope you're having a wonderful holiday weekend, Kate! The Ginger Ice Cream is great paired with so many things. So glad you enjoyed it. Ooops, didn't see your other comment. I think any plain yogurt would work just fine. If you have a favorite, use it. Adjust for sugar if you like but I think it would work beautifully. Also, let it sit at room temperature for a few minutes to soften before serving.